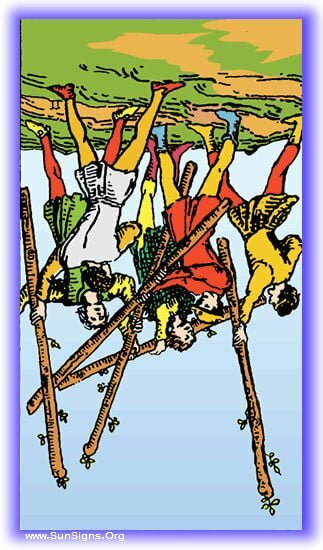 The Five of Wands tarot card represents conflicts and problems in life. In the progression of every project, you come to a point where those involved come into conflict. Sometimes this works out in the favor of those involved, engendering healthy competition. Other times it fills the situation with tension and strife, and prevents there being any form of progress. Read on to know more about this Minor Arcana Wands card and its influence in upright and inverted positions in a tarot reading. 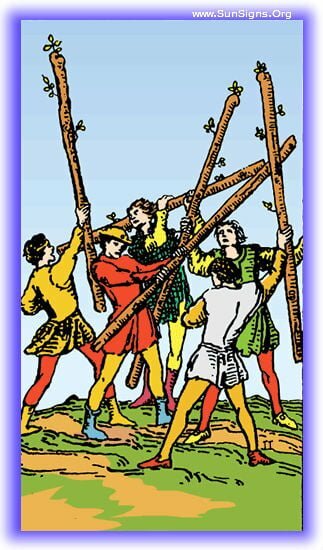 When the Five of Wands shows up, movement has been imbued with conflict and friction. The ability to work with others has been complicated by the competition and struggle against one another with the need to be right. Opinions and personalities, egos and ideas are all coming into conflict. Your project has recently come through a period of conflict and competition. Maybe your marriage has seen a butting of heads on roles and responsibilities, perhaps your co-workers had different ideas of what direction you should go with a current project. Either way, this period has passed, was it with a good resolution, or do resentments still linger? Energy is high right now, but is it being funneled in useful directions? Your current project is rife with activity and drive, but make sure you keep working on directing it in useful ways. Right now there is a tendency to conflict and competition, only careful marshaling of your forces will prevent it going awry. The boiler is building steam, and soon the engine will be powering along at full speed. But on the way, make sure the road is clear and the rail is properly laid. Otherwise you’ll find your cars trying to argue about which track to take, and the whole thing could wind up derailed. Keep an eye out Conductor! In a yes no reading for this Minor Arcana card appearing in this position is giving you a conditional affirmative. There will be a need to continue to marshal the energies going into the source of the question and make sure they continue in a positive way to achieve that yes. Work towards cooperation in this endeavor to make sure it works out properly. The only thing worse than mismanaging energy and a tendency to conflict, is avoiding necessary confrontation. Problems unresolved can result in negativity and resentment which will clog the venues of useful productivity and creativity. Remember, a little chaos often engenders new ideas, so don’t fear it! What does this Rider Waite deck card have to say? You’ve been avoiding conflict in the environment, and it’s been working so far. But only in appearance, in actuality it has been contributing to a situation that is likely about to come to a head. It’s here now, and you’ll be forced to deal with it! Time to take a sigh of relief. You’ve been dealing with a lot of conflict and struggle, but in this particular position, it represents a healthy avoidance of stress. You’ve come through a tough and chaotic time, and are getting a brief sigh of relief. It may not last, enjoy it while it does. In order to achieve the goals ahead, you’ll need to remain focused and face the challenges coming. You can’t avoid these, and attempting to do so isn’t going to assist you or the project ahead. Progress requires change and conflict, prepare for those coming. The answer in this case is a decided no, combined with a ‘stop’. Not only is your answer a negative but you’re in a time when it will be necessary to avoid working on this any further. Take a breath, let the chips fall, and know that it’s time to start looking past this ‘no’. Next Gemini Woman Taurus Man – Difficult But Not Impossible!